You know how when your “check engine” light comes on, and you finally get a chance to take it in to have it looked at, but on the way to the shop, the light goes out? ALWAYS happens to us. Most recently in North Dakota! Well, our most recent camping complications were no different! The bedroom slide worked perfectly and the furnace was a quiet hush while the island would not squeak at all! So frustrating! We got the stove burner, low point drain, and antenna replaced. Jeff, the mobile repair guy, shortened the cable on the black tank valve and says our leakage is fixed. We shall see when we get to Kentucky next week! Fingers crossed! While he was under there investigating, looking for the tank valves and what not, he had to cut the underbelly material and water came out. The insulation was all wet. He didn’t see a leak. He says that because we had wind and rain on Saturday, it must’ve blown up INTO the underbelly. I’m skeptical. But we’ll see… I hope it doesn’t come back to bite us later on because we have a slow leak somewhere. 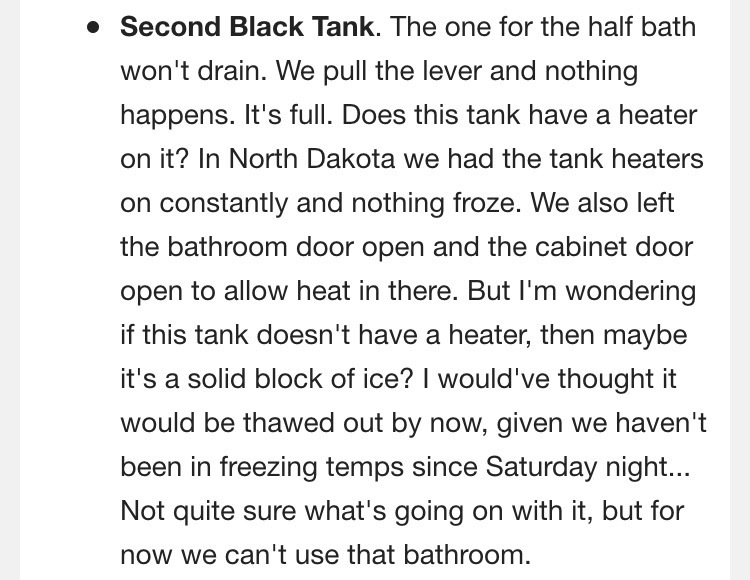 There is no tank heater on the second black tank. So wait to see if it is frozen and if it will thaw in the next few days. Jeff determined the valve was working correctly. Also he said the only possibility was that a large piece of plastic or whatever they cut to make the toilet hole fell exactly over the sewer hole and was blocking it from draining. He’d seen this once before. So he called Grand Design to tell them he couldn’t do anything about it basically. Never went inside. Took my word that it was full. (I had checked last Wednesday before sending the email. Granted, I should’ve checked again.) So then the phone was passed to me and Grand Design said I should call a “honey dipper” or “crap sucker” to come out and drain the tank or a plumber to snake it and try to knock that piece out of the way and they will reimburse me. I called the plumber. He put a camera up the tube from the outside and the tank was empty. Yes. EMPTY! It had been a frozen block of poo because it had no tank heater! Then it thawed. And it cost us $65 to find that out. You’d think the manual would mention the lack of tank heater on ONE tank, but they skipped that part. 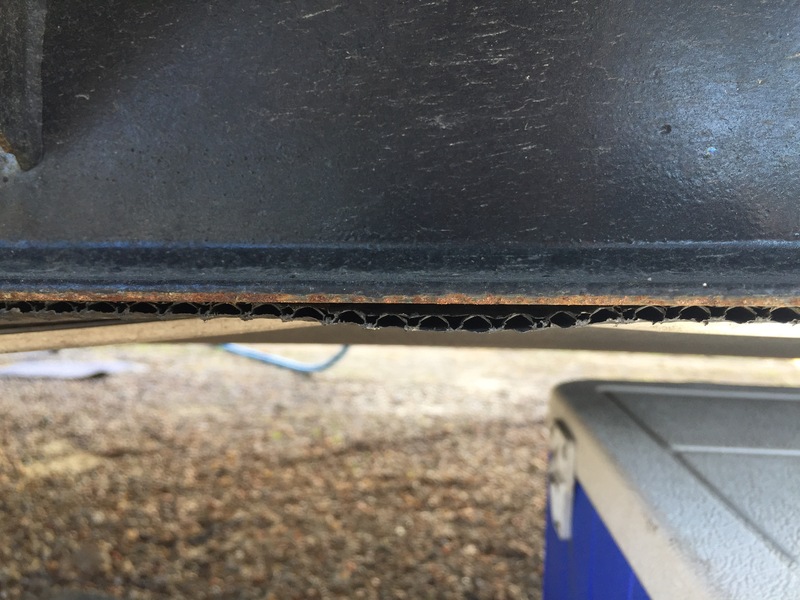 This entry was posted in 2015 Grand Design Momentum 385TH, Camper, Projects and tagged 5th wheel, antenna, camper, fifth wheel, Grand Design, leaks, low point drain, RV, stove, tank valves, tanks, water in underbelly by Rachel Gillen. Bookmark the permalink.